Dreaming of springs arrival and praying for eternal warmer weather, I decide to take charge myself by injecting this years must have colour and a little extra in to my wardrobe. This year I want to soften my look and take a different approach to life but that life jazz will be in another post, maybe a vlog thinking of taking the plunge! Filling my wardrobe with colour and character is something I never thought I'd do, but you have to grow and evolve right, that's a part of life just as it is with fashion from season to season. 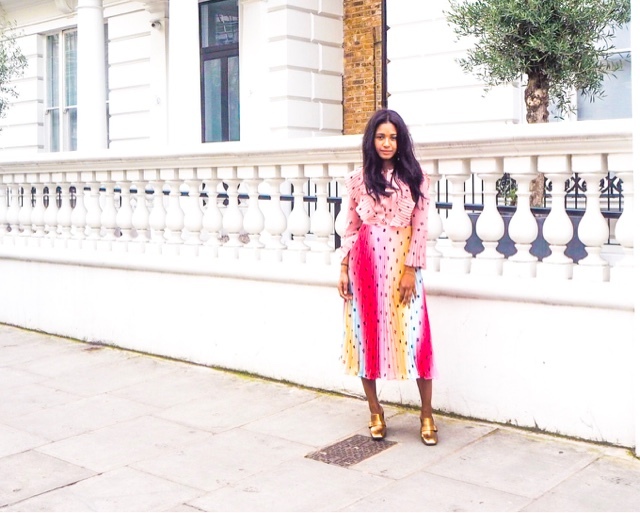 This & Other Stories beauty was my best outfit worn over London Fashion Week, a lot of pressure and stress go into having the perfect outfit, but by god I feel to my knees and thanked the heavens and Grecian gods when I saw this flower power pleat dress. 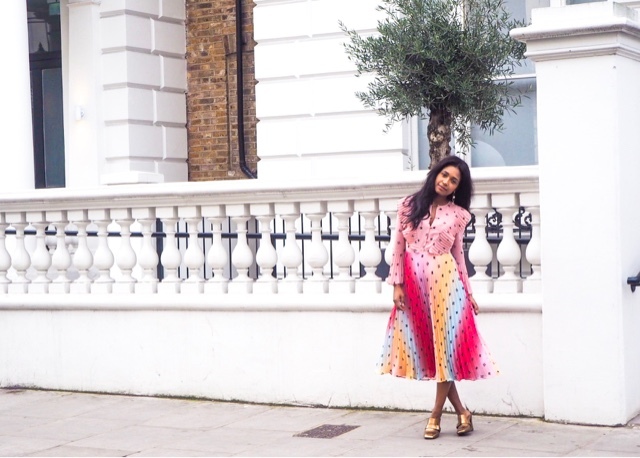 The perfect dress to entice warmer brighter days our way and it is by no means to be worn just for a day, but a dress that will take me firmly in to Spring, and one that I will certainly be layering and styling in different ways. It's soft pink shirt front nips in perfectly at the waist, giving the illusion of a tiny waist, which I'm all down for and a pleated flare bottom half which gives the look of a longer leg. For my accessories I decided to opt for a statement gold/bronze mule which you may remember from my Gucci Dupe & Cream Sweater post or spotted them on my Instagram. For me it completes this retro inspired look. For me when I'm pounding the pavement all, comfort is key and these Next mules are certainly that as well fabulous and guaranteed to turn heads. What do you think of this dress? Would you like for me to style it differently? How would you wear it? What did you guys think of the latest trends at Fashion Week, which will you be embracing? Don't forget you can follow me over on Instagram and Bloglovin too. Also let me know if you would like for me to start vlogging. Beautiful dress. You look fantastic! This is beautiful Lindsey!! It reminds me a little of a watermelon at the bottom, so adorable and great in the warmer months. I'm not a dress person and spend my life in jeans but the colours really suit you. I love dresses and this is right up my street. Love it. I think this dress has too many colors, but I like it. Omg this dress is everything! Love the splash of colors and print...its absolutely gorgeous! Love the accessories paired with the dress too.